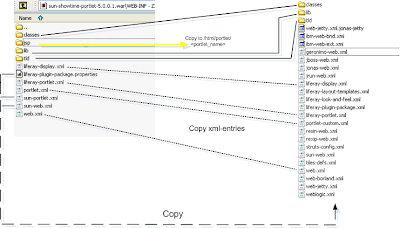 In this post i will discribe the manual deployment of portlets in WebSphere. 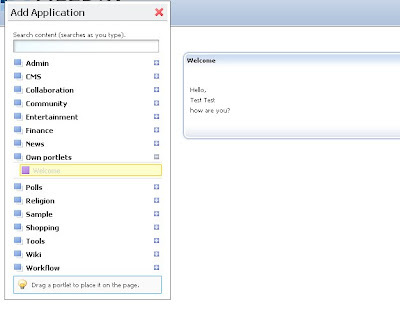 To get some information about the auto deployment of portlets in WebSphere, check out this post. Manually installation of a portlet in liferays portlet container isnt an easy think but its doable. I try to explain the procedure with an simple (self created) sample (non-struts) JSP-Portlet. Hello - username - how are you? If you want to deploy a struts portlet you have to additionally edit the struts-config.xml and the tiles-def.xml. If you downloaded a portlet form liferay.com its a bit easier. Open the downloaded war-file and take a look at the delivered xml-files. These files just contain the additional entries needed for this portlet. Copy these entries and paste them in the xmls located in your liferay installation. Also extract all resources (classes,jars, jsps) to the corresponding folder. Restart the server and thats it. By Lohitha .It's a link. 4.-Don't use liferay "Portlet Installer". Use websphere admin console "update aplication Liferay". i will try this methode this week. I am looking for such type of informative news and i get through this blog so i am very much thankful to you for sharing such a great information.